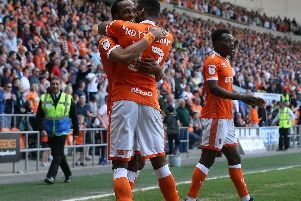 Blackpool boss Terry McPhillips is fnot surprised Nya Kirby repaid his faith with a goal on a rare start for the Seasiders. The 19-year-old scored his first professional goal in Saturday’s thrilling 2-2 draw away to League One leaders Luton Town. It was only the midfielder’s second start since his loan move from Crystal Palace in January. Kirby slammed home an impressive volley from the edge of the box to get Pool back on level terms during the first half at Kenilworth Road. McPhillips said: “They had a great start and it took us a little bit of time to settle down. “But when we did, it’s probably our first proper move that we equalise from. “Marc Bola shows his class, ran with the ball, comes inside and puts a ball in to Matty Virtue, who runs behind – something he likes to do. “Matty stands up a lovely ball but Nya still has a hell of a lot to do and he finishes it with aplomb. “I’m really pleased for him because he’s a cracking lad. It’s his first league goal. Another man to earn McPhillips’ praise was Ben Heneghan, who produced yet another exemplary display in the heart of defence. The Pool boss added: “He’s been superb, hasn’t he? He’s got better and better and he’s so consistent now. He’s strong and puts his body in front of everything. He trains like that every day and carries that on into the games. “It would have been a travesty had they scored late on but Ben makes another great block. With five games remaining, Pool’s squad is nearing full fitness apart from long-term absentees Mark Howard, Jimmy Ryan and Max Clayton, though substitute keeper Myles Boney was left out at the weekend after picking up a knock last week. McPhillips added: “We’ve got a lot of players fit now and there’s competition for places. “To come to Luton and be disappointed with a 2-2 draw is testament to the lads. “I can only pick 18, can’t I? But we’ve got a bit of a problem with goalkeepers, with Myles picking up an injury, so we couldn’t name a keeper on the bench.